Fullers Teasel can grow to six feet tall and is an architectural wonder when in full bloom! It is an easy plant to grow and is perfect for attracting wildlife to your garden, especially bees and butterflies and is famously associated with numerous small birds, especially goldfinches, who love to feed on the seed. It also offers drinking water: as rainwater and dew gathers in pools where the leaves meet the stems. 'Fullers Teasel' is not quite the original wildflower, but a sub-species of Dipsacus sativus, the common teasel. This 'Fullers Teasel' was cultivated by fullers, matured and dried and used to raise the nap on woolen cloth - to 'tease' it. The wildflower, sativus has more flexible receptacle bracts, ending in straight spines while the cultivated Fullonum has stiff bracts with recurved spines. The recurved spines worked slightly better for working with cloth, although both plants were used. The wildflower, also has smaller seed heads and is slightly taller with a height of around 2 metres (6ft). 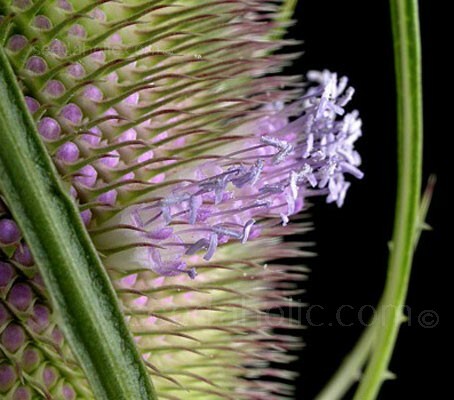 Teasel is unique in the plant world in the way in which it blooms: flowers form first in a ring around the middle of the spherical or oval flower head. The flowers open sequentially toward the top and bottom, the ring growing in width over a few days, as the flowering progresses, and since the flowers are relatively short lived, the centre of the booming section may complete its blooming, leaving two rings, one growing towards the top and one towards the bottom of the inflorescence. 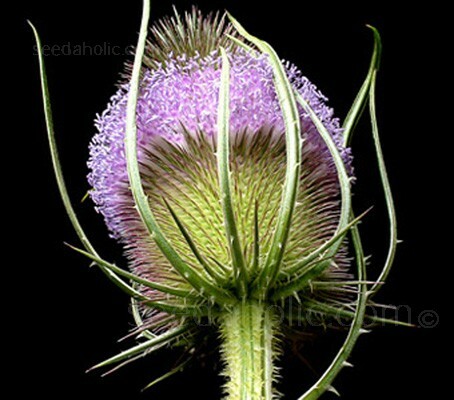 Teasel is a biennial plant; it germinates in its first year, and flowers in its second. The first year it appears as a rosette of spine-coated leaves, which die in the second year as energy is diverted to growing the tall stem. A sunny situation should be chosen, which should be prepared as soon as possible, making sure that drainage is good. Seeds are best sown directly where they are to flower, but can be sown in pots if preferred. Surface sow in John Innes compost (or something similar) Cover with a very thin layer of compost or vermiculite: they need light to germinate. The compost should be kept moist but not wet at all times. Germination 7 to 14 days. 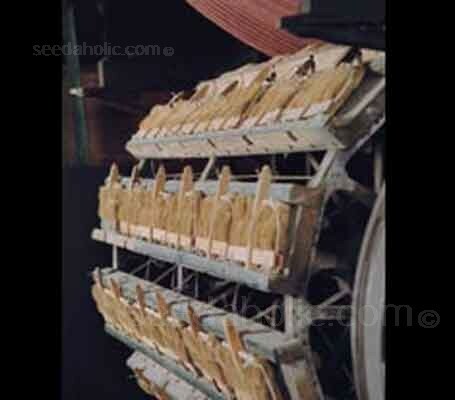 Prick out each seedling as it becomes large enough to handle, transplant into 7.5cm (3in) pots or trays. Gradually acclimatise to outdoor conditions for 10 to 15days before planting out after all risk of frost. Borders and Beds, Flower arranging, Wildlife, Bird and Wildflower Gardens. Dipsacus is a genus of flowering plant in the family Dipsacaceae. The genus includes about 15 species of tall herbaceous biennial plants (rarely short-lived perennial plants) growing to 1 to 2.5 m tall, native to Europe, Asia and northern Africa. 'Dipsacus' was derived from the Greek verb meaning ‘to be thirsty’, which is likely in reference to the water-collecting cup formed by the stem leaves. Rain water can collect in this receptacle; this may perform the function of preventing sap-sucking insects such as aphids from climbing the stem. The species name 'sativus' is taken from the Latin sativus meaning 'sown" or 'that which is sown' meaning cultivated. It is found in the binomial names of many domesticated plant species - sativus (masculine), sativum (neuter), or sativa (feminine). 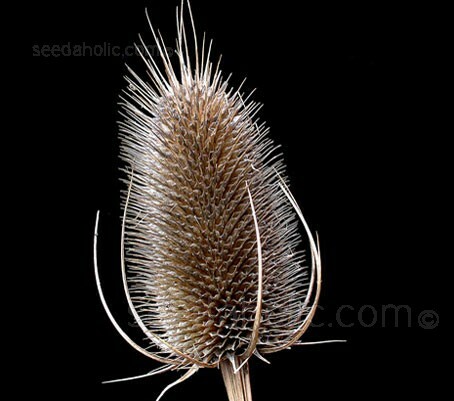 The members of this genus are commonly known as teasel (or teazle). The name comes from the Old English, ‘taesun’, meaning to tease the cloth. 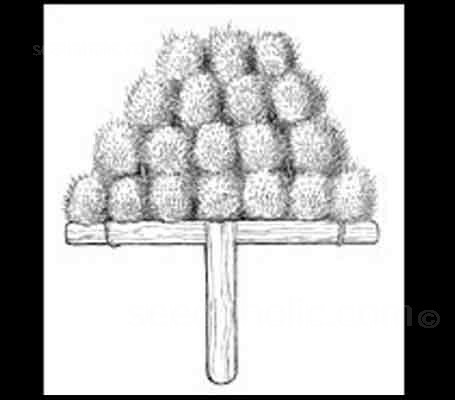 The bristly flower heads, matured and dried were inserted into wooden frames and used by fullers to raise the nap on woolen cloth - to 'tease' it – to catch the wool fibres and bulk up the pile. A handle was a wooden, cross shaped hand tool which held several fullers’ teasels. The piece of cloth was hung over a perch (a bar). 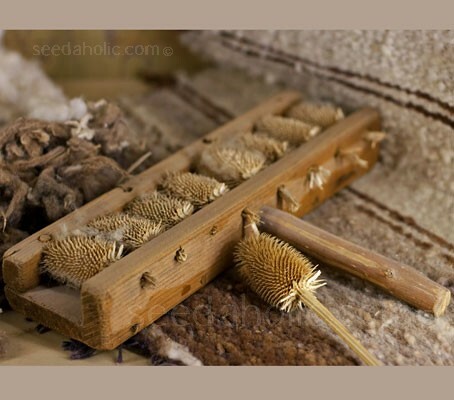 The surface of the cloth was brushed using handles of teasels thus raising the nap of the cloth. One cloth would be raised and sheared several times. 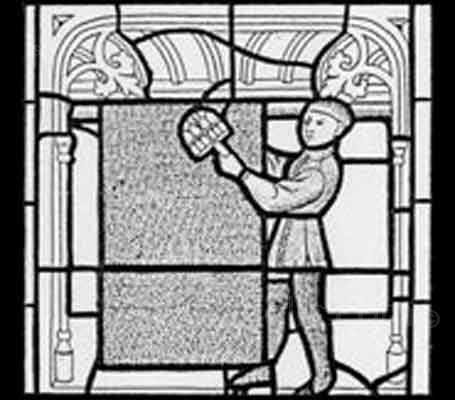 In the seventeenth century weavers introduced a 'Teasel Gig', a machine which finished cloth by rolling it over the heads of teasels and so cutting out the laborious hand raising of the nap. 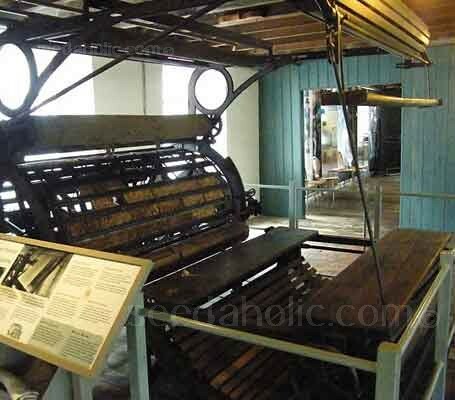 Machines with metal 'teasels' were later developed but often discounted because they could not retain the quality of the fabric – they would tend to catch the threads, creating holes. Although metal brushes have now replaced teasel, they are still used by some who weave wool by hand, being used to separate and straighten the tangled fibres before spinning. 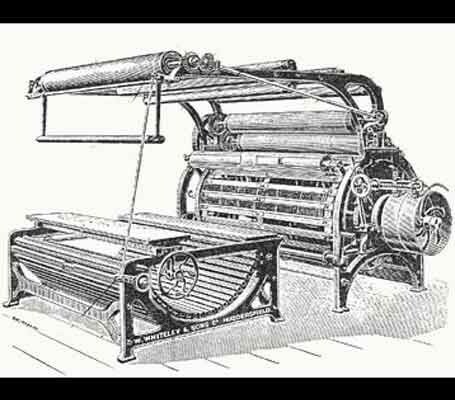 They can also still be found used in the manufacture of billiard table cloths, the coverings of tennis balls, piano felts, the upholstery and roof linings of Rolls-Royces, and Guardsmen's tunics. The Clothworkers' Company, one of the Great Twelve Livery Companies of the City of London, have a dried teasel flower head on their coat of arms.